Parasites like tapeworms, roundworms, pinworms and many others are a serious, if often neglected and undiagnosed health problem. Even in developed countries like the United States, millions of people have some form of parasitic infection. These harmful organisms may enter our bodies through contaminated water or food (particularly undercooked pork, beef and fish), mosquito bites, touching pets and other animals or any infected surface and then touching your nose or mouth. Once they find a suitable environment, they start to breed and through various life cycles can survive in our intestinal tract for many years. Common parasitic worms like pinworms, hookworms and tapeworms are found in the intestines, though other kinds of parasites have been detected in just about all parts of the human body, including the liver, blood and even the brain. It is often difficult for doctors to diagnose a parasite problem due to the wide variety of them, poor testing methods, lack of knowledge and especially the many and often confusing symptoms. These can include, but are not limited to, intestinal pain, alternating bouts of diarrhea and constipation, bloating, excessive flatulence, irritable bowel syndrome, constant tiredness and fatigue, increasing allergies and a general decrease in immunity. Black walnut is recognized as a powerful vermifuge (kills parasites). It contains high concentrations of astringent tannins, natural iodine (one of the best land-based sources) and compounds like juglone that are believed to have anthelmintic (worm-killing) properties. However, taking green black walnut hulls in combination with two other herbs – wormwood and cloves – is considered especially effective against a wide range of human parasites and intestinal worms. Dr. Hulda Clark popularized the protocol of using wormwood, green black walnut hulls and cloves together as a powerful antiparasitic treatment. While there are many positive reports of using this combination for parasites, there is some question as to the potency of a lot of the products out there. Despite having the Clark name on many of these preparations, as far as I can find, Dr. Clark herself didn’t personally supervise the formulation of any of them and the strengths can vary greatly. Of course no one treatment can be guaranteed to work for everyone. Additionally, it can be difficult to always tell when parasites are being expelled, without the type of detailed examination most people would not be interested in doing. Dr Clark was very clear though that predominantly green black walnut hulls were more effective than hulls that were darker in color. The best black walnut tincture I’ve found that is guaranteed to be made from fresh green hulls is this one. It is inexpensive but at least two would be needed for a proper parasite cleanse. There are also freeze dried black walnut capsules available with good potency if you don’t like using the black walnut liquid extract. Wormwood is a bitter herb with a long history of medicinal use. It contains many powerful active compounds including sesquiterpene lactones, tannins and thujone and, as the name suggests, is particularly good for treating intestinal worms. Herb Pharm make this certified organic extract with hand harvested wormwood from their own Oregon farm and reviews are overwhelmingly positive. Potent wormwood capsules are difficult to find but these wormwood, black walnut and clove capsules with quassia and male fern root are highly rated and could replace individual tinctures. I’d recommend getting a good supply and taking a higher dose several times a day if you suspect a parasite problem. Cloves are a tricky one as they can’t be irradiated or they lose their potency and they should also be organic and ideally as fresh as possible. One option is to get a bag of these fresh, non-irradiated organic cloves and grind them up in a spice mill or pestle and mortar just before using them. This would be best but if you know you’re unlikely to go to that much trouble each morning then this organic clove extract is non-irradiated and still potent. The suggested dosage and treatment for using these three preparations for parasites would be to start with the cloves first in the morning. Compounds in the clove like eugenol, caryophyllene and tannins attack parasite eggs, making them more vulnerable to the black walnut hull and wormwood to come. If you were using the fresh cloves you could grind half a dozen of them up, stir them into a small glass of water and then quickly drink them down. Follow this with another glass of water or two as we want them out of the stomach and into the small intestine as soon as possible. Perhaps try half this amount for the first day if you have a sensitive stomach. For the clove extract add double the suggested dose as larger amounts are generally needed for intestinal worm treatment. You’ll go through the smaller bottles fairly quickly at this rate but the extracts listed above are quite inexpensive so it’s worth getting a few. Black walnut and wormwood extracts or capsules would then be taken half an hour afterwards, also with a large glass of water and well before any food. You can start at the suggested dose on the bottle but to be most effective it can be worth building up to double the lower suggested dose over the course of a weeks treatment as long as it remains well tolerated. You should be prepared for a temporary worsening of any symptoms, usually referred to as a healing crisis, when you first begin a parasite cleanse. The signs of this can include feeling tired and rundown and even a little nauseous as toxins are expelled from your body. Usually you’ll feel better after visiting the bathroom and reducing the dosage by half the next day can lessen these kind of problems. Regardless, trust what your body is telling you and consult a knowledgeable healthcare professional if these kind of symptoms are prolonged and worsening. First thing in the morning is the best time for parasite killing treatments as there’s less digesting food to interrupt their passage through the gastrointestinal system. You can also improve the effectiveness of any antiparasitic by cleaning out your colon of the old compacted waste that intestinal worms thrive in for a few nights before starting a treatment. The two best preparations I’ve found for this are Triphala, which is an ayurvedic combination of herbs for intestinal cleansing, and Oxypowder which is an oxygenated magnesium-based cleanser. By using one of these you will be very likely to visit the bathroom when you first wake up to properly clean out your colon. The cloves taken first thing in the morning will then weaken the worm’s eggs protective coating and the black walnut hull and wormwood will follow to kill as many parasites and eggs as possible. 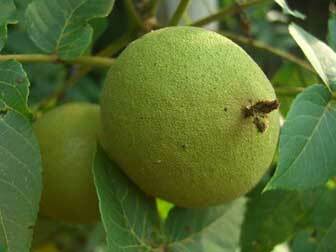 Black walnut itself has a mild laxative effect which can help to evacuate the affected parasites as well. Ideally, this treatment would be repeated again in the evening before bed. It would be better to have an early and lighter dinner if possible and wait till several hours after eating before using the extracts or capsules. While the evening treatment is recommended, if you are using the black walnut, wormwood and cloves more as a preventative or have a limited supply of the herbs then the morning parasite cleanse is the more important one. It’s also advisable to repeat this treatment for a week, at least every morning. You can then take two weeks off from the last day you used it and repeat it again for another week. 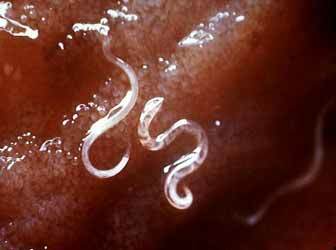 Intestinal worms and other human parasites are tenacious little critters. While I’d like to be able to tell you that one or two treatments will clear them out completely, it’s recommended to do a weekly treatment every two weeks for two months to deal with the breeding cycle. Once again, using the colon cleansing Oxypowder or Triphala the night before each treatment will greatly assist with this. The Paratrax parasite treatment made by Dr. Group contains black walnut hulls, wormwood and clove along with diatomaceous earth, bromelain, American wormseed, male fern root and several other organic or wildcrafted herbs. Another treatment that I and many other people have had success with is this parasite killing papaya seed smoothie. If I ever suspected parasites again (I travel regularly and it does happen, even when you’re careful), I’d use both the Paratrax and the green black walnut hull, wormwood and organic cloves treatment mentioned above and alternate it weekly with the papaya seed smoothie. There are many positive comments about the effectiveness of this recipe, so if you haven’t yet I’d recommend reading about it in the link above and people’s (sometimes graphic but ultimately relieving) results with using it. Hopefully this page is provided some insights into using black walnut for parasites and intestinal worms. Please share this information with your friends. It’s almost guaranteed that some of them are affected by parasites, whether they know it or not. This is an important health issue worth the time to look into. The Global Healing Center has a lot of articles on harmful organisms and their effect on your body and would be a good place to start for further reading. There’s also more on the unusual health benefits of black walnuts here. Thank you very much for your Good Effort for publishing your Column that will help millions of People to become aware about Health matter… This is very important & really very scary to ignore bcoz this is absolutely very True & people need to know all about this… Thank you for Sharing…. God Bless & more Power ! In the text above, it states you should take a fortnight off after one week’s treatment. In the next paragraph, it states you should do one treatment every fortnight. So should you take one week or a fortnight off between treatments? Please advise. Hi Andrew and thanks for your question. I’ll look at the wording there. The suggested frequency is a week of treatment, a fortnight off then another week of treatment and so on. This is to deal with parasites breeding cycle as a treatment can often kill parasites but not get their unhatched eggs. Some resources recommended repeating this for up to three months. Thank you for putting a concise and informative page up on the worm killers. Many may want to know that fortnight means 14 days or two weeks, since that is old English and rarely used by our younger generation. I have seen a company (starts with a K) sell capsules containing all 3 items (Walnut, Wormwood and Cloves) and recommending such a small dose daily. What is your recommendation regarding this supplement? Another question I have is how long should we wait to eat, if we take the the 3 items first thing in the morning? Also what foods actually feed the worms that we should avoid? I think that supplement could be effective but I prefer to use the stronger strength treatments in the article. Half an hour or so wait should be fine but it is a bit better on an empty stomach if possible. Sugar and simple carbohydrates like white bread are parasite favorites and well worth minimizing in your diet for a whole host of health reasons including parasites. The black walnut tincture might temporarily stain the nasal passage. There may also be some stinging with both it and the clove tincture. I’d suggest starting with quite a small amount of both if you want to give this a try and work up to larger amounts if this isn’t a problem. I know I have got parasites and I think it might have been caused by eating undercooked meat. I have done the papaya smoothie for 4days in a row and unfortunately all the symptoms returned after that. Could it be caused by the fact I did not actually open my bowels till the next day? I have decided now to go back to having the smoothie as well as wormwood and black wallnut hull and taking some more laxatives. I was successfull this morning. My problem is that I have taken triphala for years. Every time I go off it I start to have health problems again. Do you think my body is perhaps immune to taking the triphala? Could you explain to me why my tongue is black and I have this unpleasant metallic taste in my mouth? Can you suggest what I should do about it? Last but not least, judging by what my parasite infestation has been caused by is there a chance that my children and the people I live with are infected as well? They did not eat the meat that I was eating by the way. Thank you so much for your down to earth advice. You do want to have a bowel movement within a couple of hours of having the papaya seed smoothie if possible. Higher dosage triphala should promote this as described here: https://superfoodprofiles.com/how-to-take-triphala-churna I don’t think you are immune to it but perhaps the effects aren’t as obvious if you’ve been taking it for a while. The black tongue is likely yeast overgrowth. Parasites and candida often go together unfortunately. The black walnut hull extract held in the mouth may help with this and Curezone discusses other potential treatments http://curezone.com/forums/f.asp?f=460 but it does sound like you would really benefit from seeing a good practitioner that understands and can treat parasites and candida. It depends a lot on their immune systems and the parasite itself so it’s difficult to say. If they don’t have symptoms they may be fine but if they’re interested in doing the papaya seed smoothie it is quite healthy in its own right. Parasites tend to increase cravings for sugar and simple carbohydrates which can definitely cause weight gain. Bloating and gas can be another symptom though of course there can be many other causes of this. Would you recommend taking the papaya smoothie along with the black walnut, wormwood and clove the same day as a double punch to the parasites? I think you could and it would likely be even more effective at hitting parasites in different ways, though you may increase the risk of die off symptoms. If this happened you could half the dosage of the last treatment before negative effects and slowly build up if this is well tolerated. If you were using both I’d say have the papaya seed smoothie in the morning and black walnut combination before dinner on a relatively empty stomach. I would like to be able to help all my family members get rid of this health problem. I have had a Colonic Therapy, also just started on the Black Walnut Wormwood treatment, and it is truly working, as I no longer have food allergies with sugar and carbs. Could you kindly help me please ?? Unfortunately few Western doctors have had much experience with parasites and tend to discount them. The standard testing is also said to be quite ineffective for certain parasites. At the end of this article https://superfoodprofiles.com/papaya-seeds-parasites there is a list of tropical medicine specialists or parasitologists where proper testing and diagnosis can be done. For other countries like the UK I’d recommend searching for those terms and the nearest city to you. I’d imagine London at least would have some centers for this. Glad to hear the black walnut is working for you and wish you all the best with getting the health issues resolved for you and your family. Hi, can i give black walnut and wormwood drops to my 5 year old to treat parasites? You’d have to check with a healthcare professional regarding children I’m sorry. They often have more sensitive systems and it’s not appropriate to give individual advice, especially for younger children. How could you tell if you have any parasites, and what are the differences between pinworms, tapeworms,roundworms ,ringworms and candida? Which of these is the most dangerous and how to tell the difference if you don’t know which one you might have, do all of the parasites cause the same symptoms or is there a difference between candida and the rest i mentioned? That would be a 2000+ word article to even begin to answer. Until I have time to write it I’d recommend looking into the curezone.org parasite forum for these specific terms + symptoms and treatments. i have been doing some research about parasite treatment and luckily this information has been of great help. This product is great. I take 20 drops in the morning. I take OXY-CLEANSE COLON CLEANSER. I take 4 pills in the evening on the 1st dat and I increase 1 pill per day for 7 days. WOW. Both product combine are amazing. I just ordered Potters Garden Botanicals, which is a strong tincture/extract. This tincture extract, by Potters Garden Botanicals, contains a combination of green black walnut hull, wormwood, and cloves. The description of this item recommends that the only way to effectively rid yourself properly of parasites, is to take this herbal medicinal combination. I have not tried this before and cannot wait to put this tincture to those nasty little buggers. I have read that taking the tincture under the tongue, it is absorbed in the blood. When the tincture is absorbed in the blood, the blood is oxygenated, killing any parasites that may be in the blood. What is your opinion on how well tinctures like this obtain such authoritative access to effectively klilling parasites that may reside in the blood? Are tinctures absorbed in the blood under the tongue? The description states that the user is to place the drops under the tongue, and by doing so, is distributed throughout the body. I also purchased a colon detox that kills parasites and flushes the lower intestines and colon of parasites. Do you think this is a good regime to include with the tincture, as it would aid in a flushing affect of the colon for a better elimination process? Hi. Just started the parasite regimen ( blackwalnut tincture made my own bought the powdered cloves and the wormwood tincture ) am having a hard time drinking it . It’s aweful . What can I do to make it much more tolerable as I know I need to do this a couple times a year for parasites ? Thank you for this article, it’s very helpful. I’ve been taking a wormwood & black/green walnut I’m liquid form for the past 3 days. It’s making me extremely drowsy, I feel like I’m on Tylenol PM all day. Will this go away? Is it normal? I’d just hold my nose a shot it down like the medicine it is. I suppose you could add drops of stevia but definitely no sugar as you’ll only be feeding the parasites. Adding sugar to this would be completely defeating the purpose. Capsules are available so they may be the best option if you really can’t drink the tincture diluted in water. Alternatively try a much smaller amount in larger glasses of water and drink it over a longer period. Heavily diluted there shouldn’t be much taste. If you felt sick for longer than any initial reaction then the dosage may be too high for you. I’d suggest trying half the amount and working up slowly to a higher dosage. This is likely a detox reaction as your body processes out toxins. It should improve but if it gets too much try halving the dose and building up in smaller amounts every few days. Sublingual administration of medicines can be effective, but it’s difficult to test conclusively. It would be best to take the tincture both under the tongue and at the recommended dosage for the digestive tract which is where many parasites reside. Taking the colon detox first followed by the tincture would be a good way to use these treatments. I’m not sure on this Mary. It could be bacterial overgrowth but black walnut should help with both. Jim dillan would I be able to just only use the black walnut hulls to kill parasites? Or do I have to add something else with this herb. Would I be able to take 8000mg a day? Im taken capsules? Im starting tomorrow morning. How would I know if parasites are coming out? I have been fighting systemic psoriasis all summer,now parasites. All summer my skin has a smell. Not funky smell,but almost like really hot scorched skin. I can smell thru lotion, now since taking the Kroeger Combination, it is even stronger, and I can now taste it on the back of my tongue. I was chewing papaya seeds with melon, and a dose of milk of magnesia for 9 days, ran out and for 2 days am on the combination. Could this combination be causing the stronger smell and now taste in mouth? I also feel like my skin is not tingly, but almost asleep feeling. Sorry this is so long, but you are the only one I have seen answering questions. I was told to take the caps at bedtime,3,. Do I take for 1 week,then off for 2? I was told 1 week,off 4 then 1 week around full moon. Any help is appreciated. Mom has alzheimers, so I need to get going again. Hi there! Thank you for posting this. I referred to your post for some of the elements of the cleanse I’m now using to treat what I think is tapeworm – I’m seeing very small white worms that look like a piece of thread. What I’m wondering is about the blood/brain barrier. I read that the wormwood is the only one of the three herbs that crosses that barrier, but that it paralyzes instead of killing the worms and that it does not kill the larvae. Thus, I’m worried about treating just incase there’s cause to worry about that. Do you have information for that? Incase anyone wants to compare notes: I’m using each of the three herbs three times a day and taking double the recommended dose on the bottle each time. I’m also taking a tablespoon of dimataceous earth – about to up that to 3 times a day. AND I’m about to add food grade hydrogen peroxide. Someone I know who’s been working with DE and H202 thinks those two alone drive everything bad out of the body if you take the max amount of each – 3 tablespoons per day of DE and 25 drops per day of 35% food grade H202. The black walnut hulls should be still green for maximum potency. 8000 mg is alot. I’d start with 1000 mg and if this is well tolerated increase the amount to say 2000 mg then 3000 mg over several days or even a week between each as you build up. More than this could be a bit much for your system. If you have a bad reaction then wait a day or two and restart at half the dosage. Large parasites are sometimes visible but most are small and not readily seen. Many people feel much better after a treatment though. It certainly sounds like something is out of balance internally and both symptoms are likely related but unfortunately it’s not possible to diagnose without seeing a professional personally. For myself I prefer an experienced alternative practitioner and have had good results in the past as they treat the underlying causes rather than suppressing symptoms with drugs. I’d suggest researching a good one in your area and talking on the phone first before making an appointment to see them. On black walnut dosage and timing I take it as described in the article https://superfoodprofiles.com/black-walnut-parasites-intestinal-worms There may be something to the full moon timing but I don’t have any further insight on this. Thank-you for writing this article! If possible, please avoid the use of the word ‘fortnight’. Thanks. I have the same reaction and it seems it is from wormwood which I have been taking now as prevention for possible parasites. Did it finally stop in your case? What reactions did you have? I would not interrupt the program, otherwise. Have changed this in the article. Unfortunately it’s really difficult to get clear information on whether these herbs definitely cross the blood brain barrier. I know that black walnut, wormwood and cloves are often used in combination for their different actions, with non-irradiated cloves said to be especially good for interrupting the breeding cycle. I hope the DE and H202 goes well for you. For tapeworm within then digestive tract this papaya seed treatment is often effective https://superfoodprofiles.com/papaya-seeds-parasites The comments contain some often graphic examples of people’s results with it. I fill capsules with liq. Black walnut and wormwood and glove mixture and it works great and I don’t taste the bitterness! Hope this Helps you !! THANK YOU SO MUCH. THIS IS BY FAR THE BEST SUGGESTION/ADVICE I’VE FOUND BY FAR ! ESPECIALLY THE EXPLANATION OF THE CYCLE AND HOW TO TREAT IT PROPERLY. I JUST HAPPENED TO HAVE BOUGHT ALL THE ABOVE CLOVE ETC. YESTERDAY AND WILL BE STARTING TREATMENT ON THE 6TH. I USE CLOVE AND THYME TO CLEAN SURFACES AS THEY KILL FUNGUS, BACTERIA AND PARASITES (EGGS ALSO). I HAVE GIVEN UP ON MY HMO THEY NEVER FIND ANYTHING WHEN YOU BRING THEM A SAMPLE, THEY THINK YOUR NUTS AND WANT TO GIVE YOU PSYCH. MEDS ! LOL. I AM NOT IMAGINING MY SYPMTOMS I WISH I WERE ! THE MOST PAINFUL ONE BEING THE EGGS OR SPORES UNDER THE SKIN. YOU MUST REMOVE THEM, THE PAIN LEADS YOU TO DO SO. AMAZING ONCE THEY’RE OUT THE RELIEF ! THE AREA THEN HEALS IN LIKE 1 HOUR ! I STILL DON’T UNDERSTAND HOW THE EGGS GOT ON MY RIGHT FINGER AND LEFT THUMB BUT I KEEP REMOVING THEM. THE AREA HEALS, THEN ANOTHER BATCH SEEMS TO POP UP IN A DAY OR TWO IN THE SAME SPOT ? I WOULD ALSO LIKE TO KNOW ABOUT THE EARS. WILL DOING THE NETPOT (STEAM) FOR NOSE AS DECSCRIBED ABOVE WORK ON EARWAYS ? AS YES I’VE FELT WIGGLE WIGGLE THERE AFTER A TREATMENT FOR INTESTINES AS THEY RUN WHEN THEY ARE BEING ATTACKED TO OTHER AREAS OF THE BODY ! I AM ALSO DOING AN EYE WASH HERE (ONCE A WEEK) AND THERE AS I SOMETIMES FEEL THEM THERE. DOES ANYONE ELSE SMELL THEM WHEN TREATING OR DIE OFF ? I DO, THEY SMELL LIKE DEATH, SO DO THE EGGS I’M REMOVING FROM MY HANDS. THE STENCH IS AWFUL ! I LOOK FORWARD TO BETTER DAYS ! I was diagnosed with Dientamobea Fragilis and was treated with a very high dosage of Flagyl. My sympotoms improved and after testing my stool D. Fragilis showed negative however, another parasite called Blasto showed up. Doctors say that as long as my sympotms have improved no treatment is needed. I feel unwell everyday, suffer from fatigue, brain fog, stomach pains and slight anxiety. I am convinced that it’s caused by the parasites. Do you have any suggestions for me? I do want to try the black walnut but, am a bit scared. Any help would be greatly appreciated. hi, i read this information about 3 weeks ago… i purchased all 3 herbs did the one week (7days) and also ate very healthy no carbs no sugar. when i got to the 2 weeks off ??? on the very first day just missing the morning concoction, larvae again in mouth. it seems to me with the cycle we have to deal with this method of 1 week on 2 off is crazy ! so not to get these buggers immune to these herbs i also bought a parasite cleanse. i am doing 2 weeks that’s 14 days on then to keep something in system doing the parasite cleanse for the one week. NO off time !!! i plan on doing this for 2 months. i had to basically start all over with the suggested timing above as it did not work for me though i can see some results, being eggs in stool. i do not see worms per say. i am also starting a “basic” cleanse to remove debris from colon. i think it’s a good idea to get the intestines cleaner then go after these buggers. i have gotten the numbers down but not taking anything for 2 weeks i feel is just not the case here ! these buggers will hide and move from intestines to ears to nose to mouth trying to evade the mixture coming at them in the intestines. i know because im living this nightmare ! dr. called me crazy told me i was seeing things. i am now switching from a hmo to a ppo. i will not be treated like that from anyone who do these dr. think they are, not listening to a patient who is obviously suffering, has no idea what to look for (in begining) and basically has to treat themselves. that’s Kaiser !!! which i say goodbye my family of 4 won’t be needing your lack of knowledge or non medical help esp. with any parasite which i feel is on the rise and they are completely clueless and ignorant too ! Blastocystis Hominis tends to proliferate when your digestive system is already having trouble with bad bacteria and both are fed by sugars and simple carbohydrates in the diet. The more you can replace these with natural foods, particularly vegetables, the harder it will find to survive in your digestive tract. Sorry to hear what you’ve been going through. A lot of the comments on this page https://superfoodprofiles.com/papaya-seeds-parasites in particular mention similar problems with some doctors being dismissive of a problem most of them have little training in or understanding of. That same article has a list of specialist parasitologists if you’re in the US. That said it sounds like you’re taking the right steps. Unfortunately it does take time to deal with the breeding cycle and you won’t often see parasites being expelled but the proof should be in your improving health. I’ve found the oxypowder product https://superfoodprofiles.com/go/oxypowder-global-healing-centre very good for removing debris from the colon but I’d only take it when you’re home for the day. What dosage did you give to your daughter please? I caught a food born illness from a restaurant (crypto) for short it’s a worm in your intestines and I needs this gone it is interfering with my work and making me extremely tired . My question is since I have diverticulitis I can’t have any kind of nuts and you recommend doing this in the morning and I’m a hairstylist and I sometimes have to be at work at 9 o’clock should I get up earlier than normal and how severe is the cleaning out process going to be is it going to cause cramping ? With the treatment described on this page https://superfoodprofiles.com/black-walnut-parasites-intestinal-worms it’s a concentrated extract from green black walnut hulls so just drops you add to water, likewise with the wormwood. The clove oil also comes in extract. The best I’ve found of these are in the article. It’s hard to say how your reaction will be the first time but it could be best to have the first dose on a weekend so you can see how it is without worrying about work. For most it’s fine but if it’s too strong try halving the dose until you have no problems and then slowly building up from there. How long should i have to take black wallnut to get ride off parasites? And do i have to take that pill for empty stomach or with the food? There’s detailed instructions in the article https://superfoodprofiles.com/black-walnut-parasites-intestinal-worms from the Black Walnut, Wormwood and Clove Parasite Treatment section down. Every time I click on the link to the list of recommended parasitologists, it says the page has been removed. Can you re-direct me to another list? Thank you! Hi Susan and thanks for letting me know. As a website owner I’m really surprised the number of sites that can’t do a simple redirection when they change an important page. On the positive, here’s the link http://www.astmh.org/for-astmh-members/clinical-consultants-directory and it looks to be more up to date with listings. Thank you for the info! I have been suffering with Blasto for 7 months, (lack of apetite, nausea, depression) I know its from this parasite. How do we take the Black Walnut, Wormwood and Clove extracts? How do we use them/How often and how many drops of them do we use? Do we just add the drops to the water? More details on this would be so very helpful as I am on a tough mission to get through this! I almost want to give up on life sometimes. Sorry to hear the trouble you’ve been having with Blasto. It does seem to be a problem for many people and unfortunately most regular doctors don’t have much experience with it and I often hear from people that they don’t take it seriously enough. It could be worth looking into this directory of parasite specialists and seeing if there’s one in your area http://www.astmh.org/for-astmh-members/clinical-consultants-directory Traditional Chinese herbal practitioners can also sometimes have more success treating parasites than ‘conventional’ medicine, though I’d call first and discuss their experience with parasites. For the article https://superfoodprofiles.com/black-walnut-parasites-intestinal-worms the sections on Dosage and Treatment and Treatment Timing past halfway through the text has the best recommendations from my research. There’s also a lot more on parasites in this article https://superfoodprofiles.com/papaya-seeds-parasites and the many comments. I just purchased NOW Fresh Green Black Walnut Wormwood Complex w/ cloves, from Botanic Choice. It says to take as a supplement 1/2 to 2 droppers full 2 to 3 times daily. Is this a good dosage for parasites? 3,Now Foods Fresh Green Black Walnut Wormwood Complex, 2-Ounce ? and how about the Dosage and treatment? The treatments I found with the best strength are in the article https://superfoodprofiles.com/black-walnut-parasites-intestinal-worms but it will depend on the strength of the product as to it’s effectiveness. I’d suggest following the directions at the higher dosage of the product you have. Hopefully it will work well for you. As detailed here https://superfoodprofiles.com/papaya-seeds-parasites it’s often recommended to take the treatment for several months to deal with parasites breeding cycles. Kroeger is a good brand and people often report positive results with it. As per the dosage section of this article https://superfoodprofiles.com/black-walnut-parasites-intestinal-worms I’d start with the recommended dosages and increase a bit further as long as it’s tolerated well. Also note the suggestion on taking the cloves before the others and drinking plenty of water. This was extremely helpful, informative, and easy to understand. I wasn’t sure about the ideal times to take these extracts but now I know! The recipes were A nice bonus:) – Thank you! Thanks for your positive comments Kurtis.